Waku Waku (apparently means Tremble in Japanese, can anyone clarify?) is another newish Japanese restaurant situated in Midvalley Megamall. This restaurant has been on my radar after seeing Sean‘s blog about their Nasi Lemak Jepun. Altering a traditional recipe can be risky but I applaud them for giving it a go. Though I think my Japanese friends would be horrified seeing these dishes on the menu! Hehe. Apart from the regular Japanese such as sushi and sashimi, Waku Waku has a whole page worth of Pan-Asian dishes with Japanese touch. Char Kueh Tiaw, Bibimbap are amongst these interesting dishes. It seems that they are rather excited about their hamburg steaks too, serving them in various styles. I met up my mum and brother who have both just settled in KL in Midvalley couple of weeks ago and naturally I chose Waku Waku for a tea break (late lunch for me). They have both eaten lunch so the 3 of us shared these 2 dishes. Instead of going with the usual Salmon Sashimi, we decided to order the Carpaccio as my brother was drawn to the picture on the menu. Lovely presentation and the salmon slices were quite fresh. 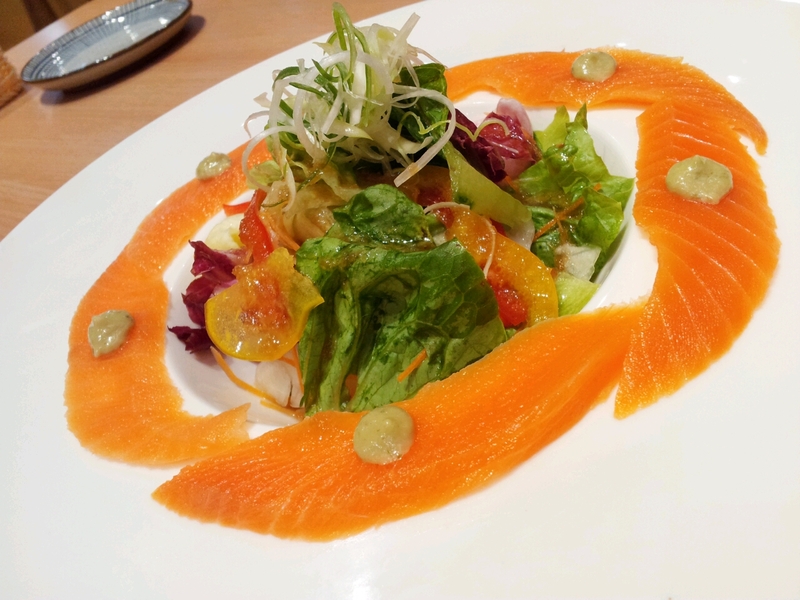 I like the dressing (wafu, I think) they used on the salad. However, sparing a little dressing on the salmon would be nice too as they were quite tasteless. I assumed the green dots to be wasabi mayonnaise, but failing to detect any hint of wasabi. It didn’t add anything to the dish anyway. My Nasi Lemak Jepun (Japan) was indeed an innovatie dish. Comes with a runny egg on the rice in a hot stone pot, braised soy sauce chicken, mild prawn sambal, pickled radish, anchovies and peanuts. The chicken drumstick was exquisitely tender and nicely seasoned (you can’t go wrong with a braised chicken dish I guess), and the sambal complements well with the rice which was coated with egg yolk (!) and still sizzling away. I didn’t really detect much of the coconut fragrance though. The pickled radish provided a much need piquancy to balance the richness. Best thing about this dish? Crispy rice at the bottom from the hot pot. Overall quite a successful dish. The service was polite and attentive. And the pricing is quite reasonable as well. I’d come back to sample more dishes here. Particularly the pan asian dishes. Hey!! Thanks for dropping by 😀 Let me know if you do try the hamburg steaks! They sure look good in the pictures! Ah so they have hamburg steaks here… I’d like to try that! Yeah a whole page dedicated to hamburg steaks! oh so interesting! I love the nasi lemak Jepun! and nothing beats the crispy bits at the bottom of the bowl! (: x was really nice meeting you btw! Hope you had a good flight back! Awesome catch up 😀 Hopefully we’ll return soonish! Yeah I believe they used sushi rice in this. The char kueh tiaw also has a runny egg on top but otherwise looks like normal CKT. Japanese nasi lemak? This is something that I need to try for myself! Think bibimbap with nasi lemak flavours! Yum! Nasi Lemak Jepun in stone bowl..yummy! 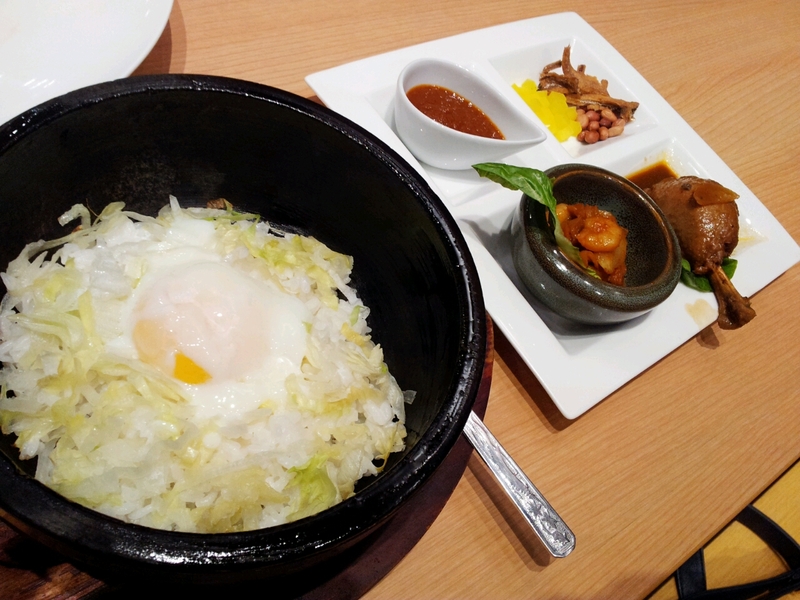 Does it look like Korean stone bowl rice..only with different flavor? This Place(Waku Waku) sure sound interesting with it’s pan Asian menu. I would like to go for a try if I am in KL. Yeah it’s pretty much like the stone bowl rice with the crispy bottom and runny egg but just with different toppings and flavour profile I guess. It still tastes very much like nasi lemak. Hahahahah nasi lemak jepun… sigh… i love the ingenuity of dishes in Malaysia! But but…. I prefer food in Melbourne….. everything’s just tastier because of the fresh produce! Super Kitchen Chili Pan Mee: Not for the faint-hearted!